Derek Sheils bagged a double in the Open and Grand Final events at the Faugheen road races, with William Dunlop winning the Supersport outing. Dunlop, who had already been crowned Irish Supersport champion, made it nine wins from nine starts in the 600cc class at the Irish national road races. The 30-year-old had more than three seconds in hand over Derek McGee. Sheils won the feature race of the day from McGee, Waterford's Brian McCormack and Dunlop on his Tyco BMW Superstock. The Bike Bits NI Kawasaki pilot earlier took the honours in the Open class, ahead of Kilkenny man John Walsh, with Dunlop rounding out the top three. 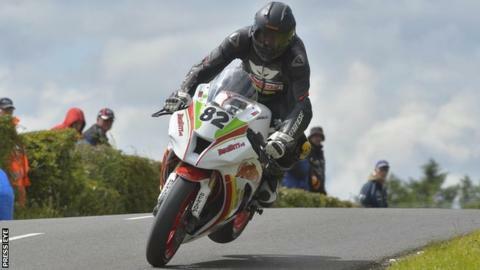 Mullingar rider McGee followed up his Supertwins success at the Ulster Grand Prix by triumphing again at Faugheen, seeing off Magherafelt's Paul Jordan, with Czech racer Michal Dokoupil in third. On Saturday, McCormack took his maiden success at an Irish national road race, beating McGee in a closely-fought Non-Championship Open race. Meanwhile Northern Ireland riders Ryan Rainey and David Haire were victorious in the two Superbike races at the Adelaide Masters round at Bishopscourt, with Conor Parkhill a double winner in the Supersport category.